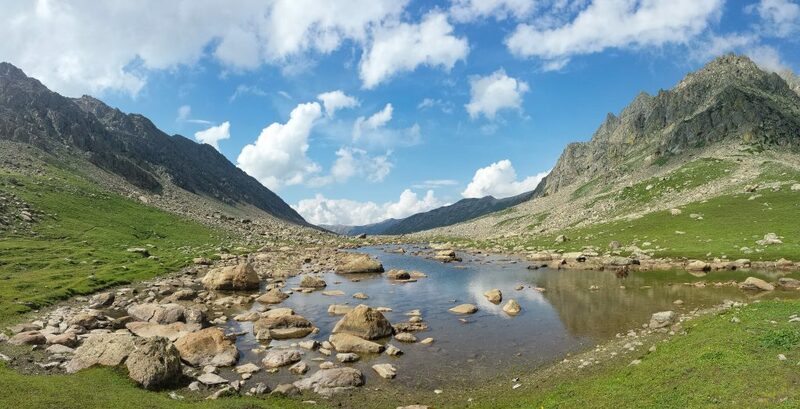 Our reason for visiting northern India was to go trekking. 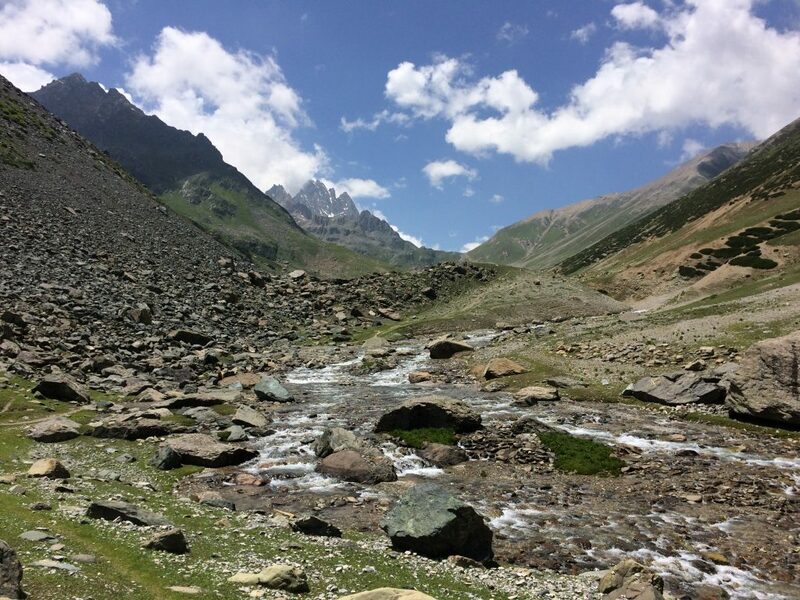 Unlike the rest of the country which is experiencing sweltering heat and monsoon rains, July and August is hiking season in Jammu and Kashmir (the state of J&M includes Ladakh – I’m unsure why it’s not J,K&L!). Our e-visa gave us 60 days so rather than head straight to Leh, Ladakh we decided to first explore Kashmir. 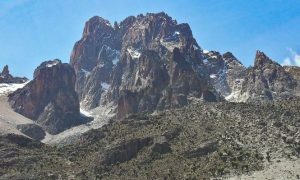 The trek we had planned to do was the six-day Great Lakes Trek. 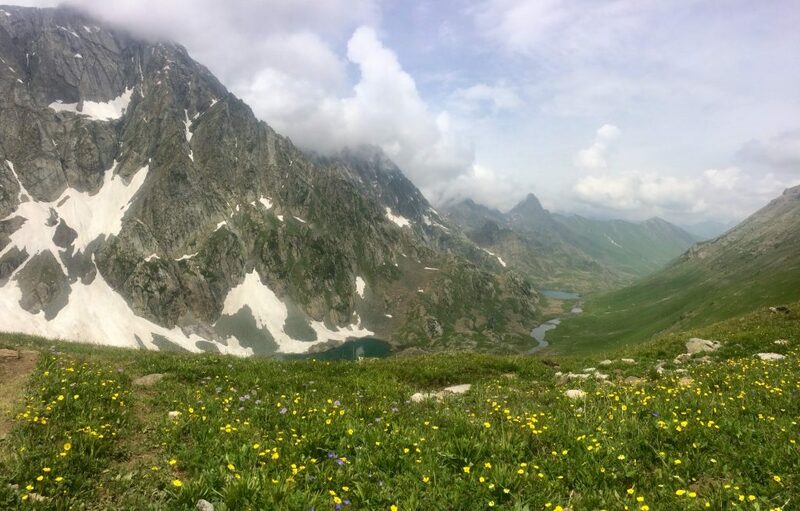 After an exhausting 34 hour jeep ride to Kashmir and a much needed relaxing few days on a houseboat in Srinigar, we made our way to Sonamarg, the starting point of the trek. 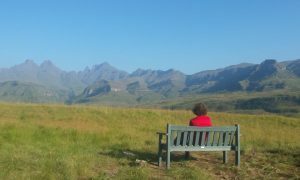 It is possible to start walking the same day but we decided to give ourselves a night to acclimatise. It was bucketing it down all morning but thankfully it cleared into a beautiful late afternoon and we enjoyed a little warm-up walk to the Thajiwas Glacier. We awoke to beautifully blue skies and were picked up by our guide, Farooq. We dropped one bag with Nazeer, the horseman, and set off from his garden. After crossing the river, we were immediately climbing up a steep zig-zaging path through pine forest and meadows. Soaring snow-capped peaks and lush valleys completed the beautiful setting. We climbed for two hours before dropping back down to the raging river which we followed up stream through the Nichnai Valley to our camp at the base of the pass. The second morning brought with it our first pass of the trek as we climbed the 3995m Nichai Pass. From the top we enjoyed a wonderful view into the expansive Vishansar Valley with imposing peaks towering over us from all directions. It was downhill from here and a gentle walk through the wide-open valley past carpets of wild flowers and boulder hopping across the winding river to our camp near Vishansar Lake. 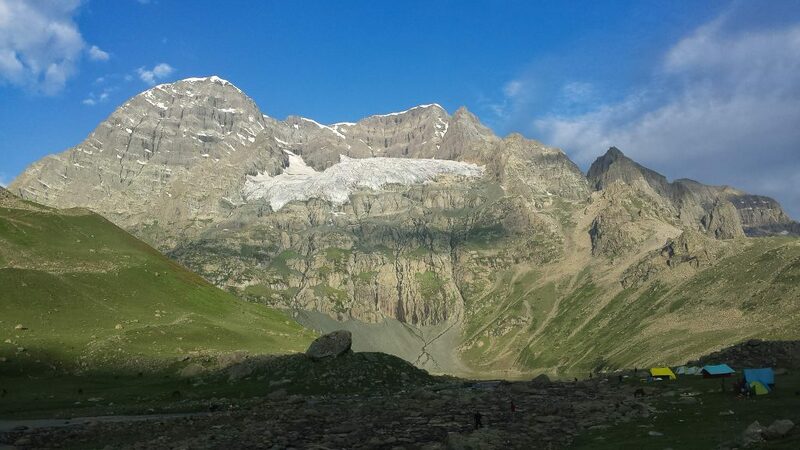 It was a short walk from camp to the lake itself, which sits at the foot of a number of jagged snow-capped peaks. On our way back we saw an animal we’d never seen before – it looked a little like a rock hyrax but it was much bigger and it had a fluffy tail. We subsequently learnt it was a Marmot! We were camping in a particularly beautiful spot right on the river with peaks of different shapes and sizes all around us. There were also hundreds of sheep everywhere we looked and it’s quite amazing how much noise they can make! We spent the afternoon reading and playing cards in the afternoon sunshine. At the sun was starting to go behind the mountain, we noticed the sheep being rounded up – a particularly impressive operation given their numbers. Once darkness fell, the stars filled the sky and despite the constant barking of the two sheep dogs, we slept well. We awoke to a beautifully clear morning with the circa 500 sheep still together across the river. 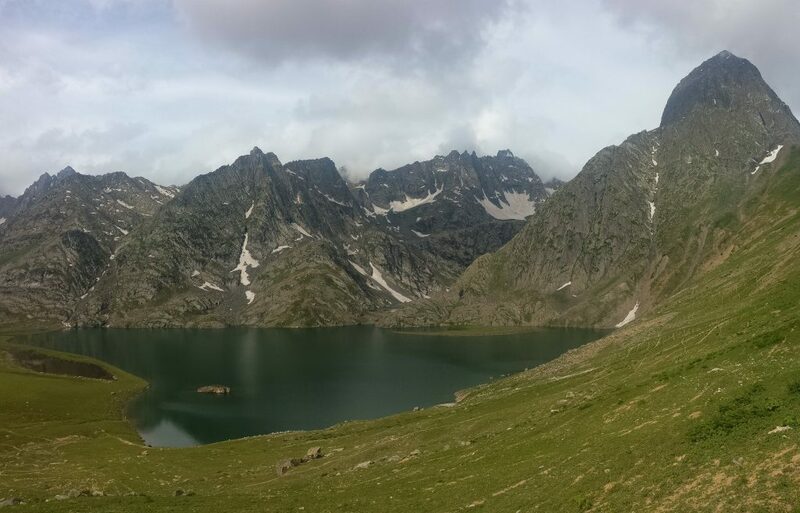 We made our way back to Vishansar Lake, which was a beautiful colour in the morning sunshine, and started climbing our second pass of the trek, the Gadsar Pass (4050m). 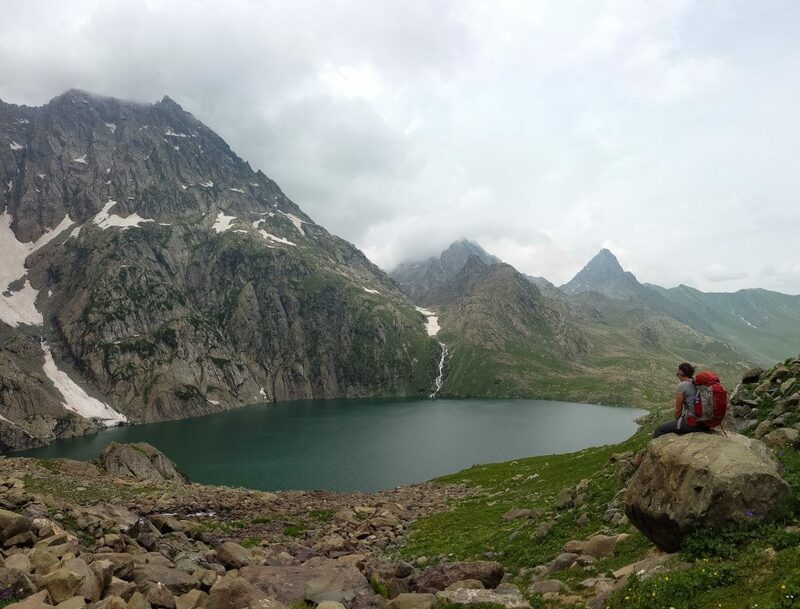 After an hour we arrived at the smaller but equally beautiful Krishanasar Lake and both remained in view under a cloudy sky as we climbed the steeper and longer pass. 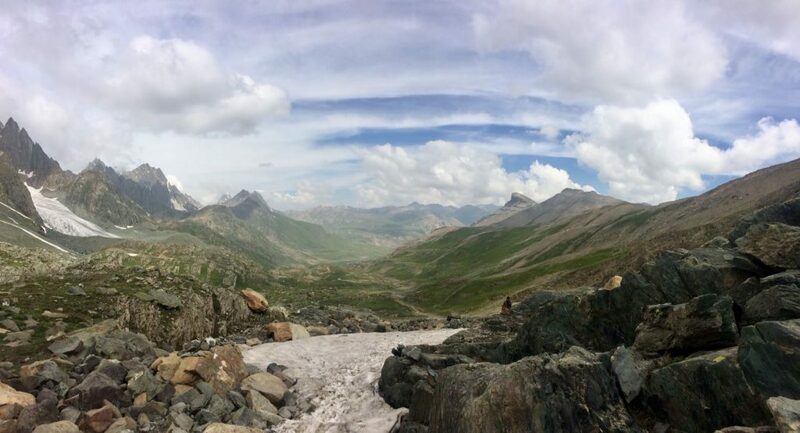 We enjoyed a few snacks at the top before dropping down into the Gadsar Valley. The valley was much wider and bigger than the previous day and it reminded us that even in a country as populated as India you still find these huge, open, quiet spaces. A clear river flowed all along the valley floor and large parts of the valley were covered in red, blue and yellow wild flowers. 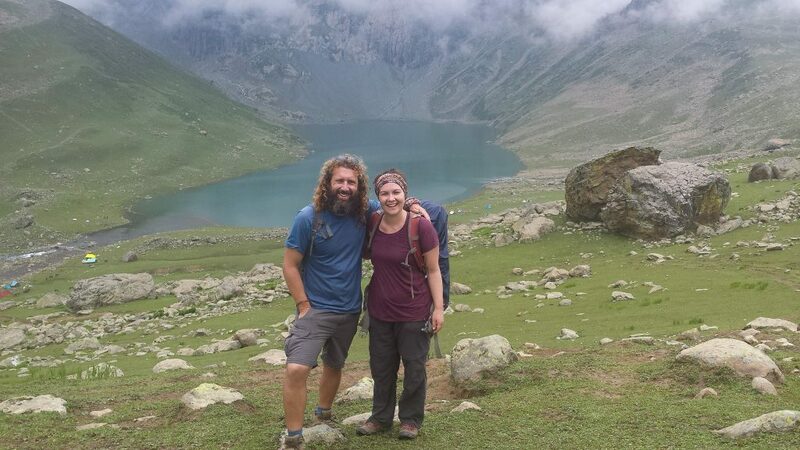 It was a gentle but long walk, past flocks of sheep, through the imposing valley to Gadsar Lake and onto our camp. Rain started to fall at dinner and continued all night. When our alarm went at 6, the valley was blanketed in cloud but pockets of blue sky had appeared by the time we started walking. We thought the sun would burn off the cloud but we were wrong! 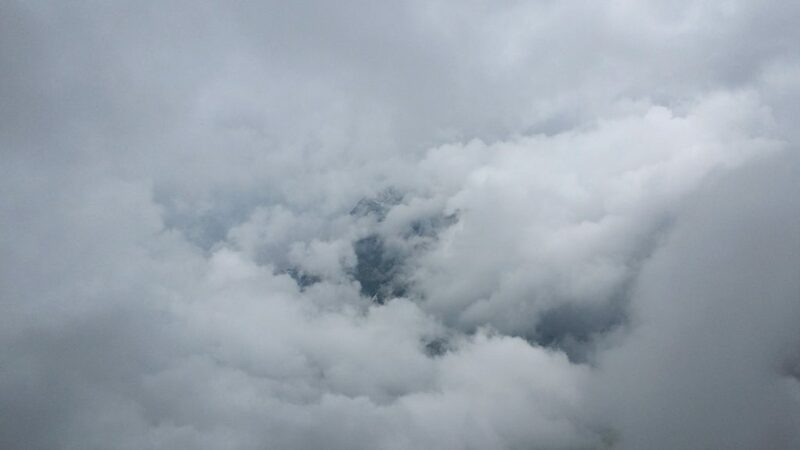 The clouds persisted all morning with a steady rain also falling for a while. 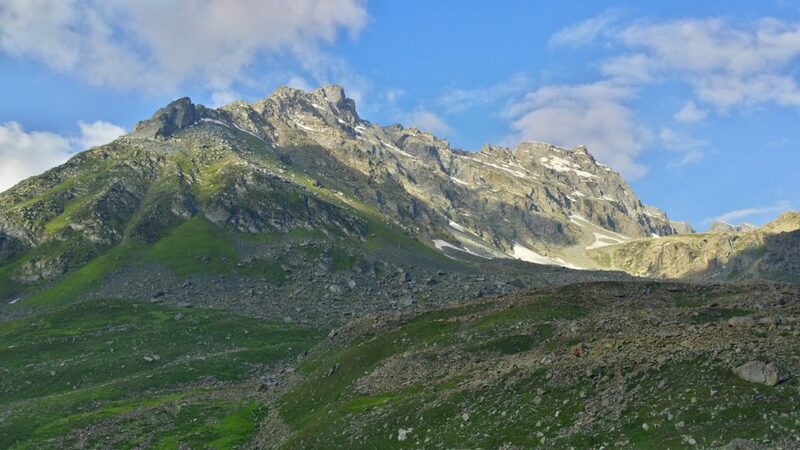 We noticed the peaks making up the walls of the valley were far rockier than previous days and it was slow going hopping across the slippery rocks that filled the valley to our campsite at Megandoab, just past Satsar Lake. We had hoped it would clear in the afternoon and we were in luck as we awoke after our post – lunch nap to a sparkling lake and steep, rocky mountains framed by blue skies. Despite falling asleep to a bright moon and a clear, starry sky we awoke to a thick blanket of cloud and fog. We decided to give if time to clear and by 10am, it looked a little clearer and brighter in the direction we were walking. After boulder hopping for 30 minutes, we began zig-zaging up the 4180m Zajibal Pass. It wasn’t as steep or as long as we had expected but sadly a blanket of cloud followed us to the top so that we had virtually no view other than Gangabal Lake and Mount Haramukh (5300m) popping into view for a very brief few seconds. We descended to our campsite on Nundkol Lake and after lunch we headed across to its neighbour Gangabal Lake, the largest of the lakes in the region. With the clouds hanging around all afternoon we played cards in our tent and enjoyed a few cups of tea before our final delicious dinner in the horseman’s tent. Thankfully the clouds all disappeared overnight and we awoke to a magnificent view on our final morning. The final day’s trek took us round the mountain before dropping very steeply to the village of Naranag. We explored the ruins of a 8th century temple before hopping in the car back to Sonamarg where a luke-warm shower was desperately needed! We went trekking with Cliffhangers Asia. Overall they were excellent – the trip was well organised, the equipment (tent and roll mats) was good and the food was delicious. Sadly our guide wasn’t brilliant but we did pass on feedback after the trek so no doubt he will improve. Aarif is one of the partners and his WhatsApp number is +91 9018056175. We found them on Facebook. 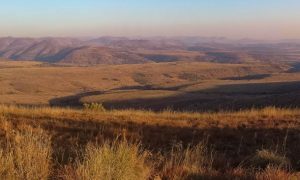 The cost for a private trek was INR 25,000/person (£1=INR 90). 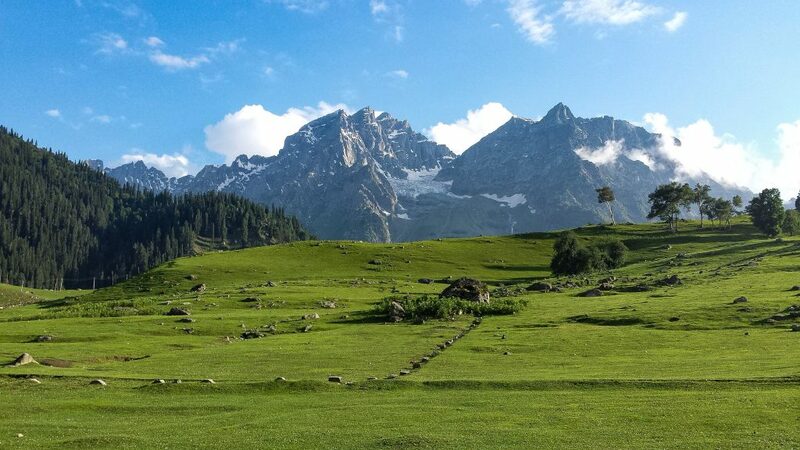 This price included transport to Sonamarg from Srinigar and back to Sonamarg after the trek, accommodation in Sonamarg before and after the trek, all camping equipment, food, permits, horses and horseman. 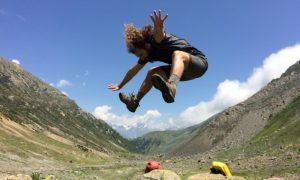 A friend of a friend recommended www.trekkashmir.com but their fixed departure dates didn’t work for us unfortunately. You can halve the cost if you go in a group. 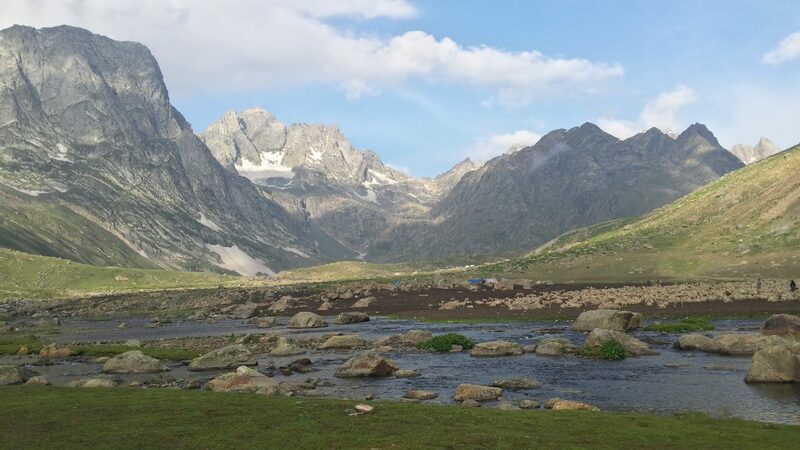 Kashmir Treks had fantastic reviews but unfortunately Mehraj was not available. His private trips are INR 19,900/person.